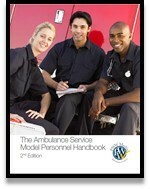 The Ambulance Service Model Personnel Handbook | PWW Media Inc. This product will be immediately available upon receipt of payment. Get the tools you need to effectively deal with human resources challenges today.